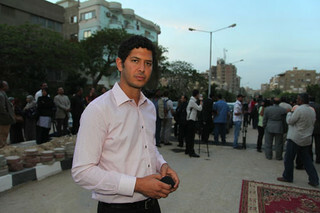 Sharif Abdel Kouddous - Profession: reporter. The award-winning Egyptian-American Democracy Now reporter and Nation Magazine writer Sharif Abdel Kouddous, who grew up in Cairo in a prominent family and went to college in the US, returned to his home town as the January 2011 Youth Revolution began and has remained there providing articulate and well-informed reports for Democracy Now and articles for the Nation. In early days when the Internet was cut by the government, through his colleague Jeremy Scahill and an American cell phone Kouddous sent an on-the-spot Twitter feed at a key moment that quickly got him 18,000 followers. Kouddous has had an almost unique position as an Egyptian fully conversant with the complex political landscape of Egypt today and able to describe it in clear and lucid English. Rather than presenting a facade of neutrality, he has lived the Revolution, from excitement and hope to despair. Due to his having dual citizenship, working for a foreign publication and writing in English, and perhaps also his prominent family, Kouddous has so far not been harassed or jailed as other Egyptian journalists have. Though he has never lost his objectivity, his passion informs his reporting. Below is a summary of his writing for The Nation over the last eight months since the Mohamed Morsi, the Muslim Brotherhood's elected president, was removed from office, as the country has slid into repression, polarization, chaos, and military rule and the beautiful dreams of Tahrir Square have seemed to vanish into the desert air. Some background on the Revolution and its aftermath. The Egyptian Youth Revolution of 25 January 2011, which Kouddous has reported on from Cairo since its inception, often direct from Tahrir Square for Democracy Now, brought the country a tremendous spirit of democracy and hope. But when Egyptian presidential elections were held in June 2012, almost by a fluke the relatively minor Muslim Brotherhood candidate Muhammad Morsi won. It was a bad choice. Morsi began to act in a more dictatorial and heedless manner than Mubarak himself, usurping judicial authority and placing unelected MB representatives in positions of authority all over the country. In protest against Morsi's incompetence and authoritarianism Egypt took to the streets again, more massively than ever. This time it was to bring down a democratically elected national leader, clearly not a good idea. The better alternative would have been to push for early presidential elections, which now isolated liberal dissident Amr Hamzawy wishes had occurred. But following mass opposition protests starting 30 June 2013, on 3 July 2013, Morsi was forced out of office. But the means was not democratic. He was removed in a military takeover headed by Defense Minister General Abdel Fattah El-Sisi, acting on the pretense of maintaining order. A massive counter revolution and "war on terror.. The removal of Morsi became an excuse for the SCAF (Supreme Council of the Armed Forces), which had been in charge after Mubarak's resignation, to take full charge of the country, now headed by El-Sisi. Over the past eight months the military has staged a massive counter revolution marked by killings and imprisonment, notably of journalists, including foreign ones. This new-old military regime (because it was always there) justifies its acts as a now widely supported "war on terror." "Terror" it defines mainly as the Muslim Brotherhood, but also progressive elements. Abdel Kouddous's post-Morsi Nation coverage: betrayal of the revolution. (Links are to separate Nation articles.) Abdel Kouddous has been writing a flurry of articles in The Nation over the past eight months describing how the crisis in Egypt has deepened since Morsi's ouster. (Each link below is to another of his Nation articles.) He has described how popular opposition to Morsi was exploited by the military. Opinions differed on whether it was a military coup; in retrospect evidently it was, one aided by popular will. But who would have predicted the brutal war on the Muslim Brotherhood the military would carry out? Pro-Morsi demonstrators were massacred last summer, leading to increasing chaos, violence, and polarization in the country. The Muslim Brotherhood refused to cooperate with the military, and the split and alienation of the strongest party paved the way for growing authoritarianism. Not everybody wanted this, of course, but Egypt, always friendly to the military (which has exercised control for sixty years), welcomed their control and promise of order. The Muslim Brotherhood's rise and fall had been rapid. In retrospect it was a mistake to go for the presidency. At any rate, the violent clashes last summer ruled out rapprochement between the Brotherhood and the military. Abdel Kouddous cited the revolutionary saying, "Despair is betrayal," but by late summer 2013, uttered the grim declaration that, with no end to the chaos and bloodshed in sight, "Today, it is very hard not to feel like a traitor." Scapegoats; divided loyalties. Later last year Kouddous' focus shifted to other groups besides the Muslim Brotherhood. There were over 300,000 Syrians in Egypt who fled from the civil war, and the military regime began to scapegoat Syrian refugees as well as Palestinians. Multiple opposition groups, some opposing pluralism yet lumped together as "liberals," have grown oddly silent, Kouddous wrote. Mohamed ElBaradei, who spoke up, was demonized and resigned his post and fled to Vienna. But in this article, "What Happened to Egypt’s Liberals After the Coup?," Abdel Kouddous also lays out some of the greater complexities of what he calls "Egypt’s convoluted political landscape" as it has developed lately. In December, Abdel Kouddous wrote about how as repression deepened in Egypt, "dozens of journalists, non-Islamist activists and students have been detained and beaten." Jailing of Al Jazeera journalists who were not Egyptian brought more foreign recognition of the regime's repression. The military have focused on Al Jazeera because it is regarded as having championed the Muslim Brotherhood. And now the attention has shifted to activists and bloggers like Alaa Abd El-Fattah. He and others hope to maintain focus on the main aims of the Youth Revolution of 25 January, "bread, freedom and social justice." A downward spiral toward repression and fascism. In January 2014 Kouddous wrote a grim summary of "Egypt in Year Three" since the Youth Revolution of 25 January 2011, describing the country as "awash in conformist state worship, fueled by the shrill narrative of a war on terror". The old pre-revolution fears and insecurities about public debate and discussions with strangers have returned. An Egyptian brand of McCarthyism now reigns. The Muslim Brotherhood has been declared "a terrorist organization," though its members still rish their lives and freedom to demonstrate in protest. University campuses have become chiefly sites for protest. Jails are bursting with prisoners. A new constitution replacing the Muslim Brotherhood one has been pushed through. El-Sisi is now worshiped as if (my words) any Pharaoh will do. "The country," Kouddous wrote, "is headed toward an order even more regressive than the one people rose up against three years ago." Blogger All Abd El-Fattah, sent to jail under every regime, a warrant out on him under Morsi, was sent to jail by the El-Sisi government with unusually little protest this time in the mood of jingoism and repression. The now isolated dissident Amr Hamzawy, a politician who was elected after the revolution and a professor of public policy at the American University in Cairo, now sees clear signs of a governmental and country-wide "fascist buildup" in Egypt, , Kouddous reported in a 12 Feb. 2014 Nation article. And that's where Sharif Abdel Kouddous's Nation coverage leaves us today. Next we'll report on his interview with the dissident blogger Alaa Abd El-Fattah, who has recently been re-released from jail after several months.